Virginia started her career as a teacher working with Individuals with Developmental Disabilities at New Advances for People with Disabilities (formally known as Easter Seals ). Her experience and passion for working with the I/DD population NAPD opened the doors to a job at Kern Regional Center. Virginia worked at KRC for over 30 years in different positions in Case Management. She started as a Service Coordinator/Case Coordinator in Residential Unit, moved to the Prevention Unit now known as Early Start. She also worked in the Assessment Unit and then she was promoted from Service Coordinator to Program Manager. Virginia was later promoted to Director of Client Services where she worked for many years until leaving KRC in 2013. While working at KRC Virginia along with parents and other KRC professionals started attending Fiesta Educative at USC. Because of growing need for a Spanish Conference in Kern County Virginia along with parents and other professionals founded the conference known as Celebracion de Familias Excepcionales . 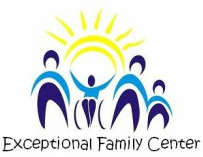 From that conference Exceptional Family Center was created years later. Last year was the 10th anniversary of this successful conference. Years after leaving KRC, Virginia was certified by DDS as a DSPT (Direct Support Professional Training) trainer and was hired by Bakersfield Adult School to teach DSPT Classes and later hired to teach other classes at BAS. Virginia has a MA degree in Special Education from California State University, Bakersfield, and BA degree in Psychology and Criminal Justice from California State University, Bakersfield. Manuel has been involved with Exceptional Family Center since August 2012, when he was hired to be the computer instructor at the Technology Center. He was offered a permanent position in November 2012 and has been given the opportunity to grow since then. Manuel is now the EFC Program Director of Exceptional Family Center; besides his duties and responsibilities as Director, he continues to teach beginning and advanced computer classes, is a Notary Public and is very much involved with outreach events in the community that expose EFC and its services to those in need. As the computer instructor, Manuel understands the challenges that parents of children with special needs face and he believes that they should take time to focus on their needs and obtain valuable computer skills, that can help them move forward in today's competitive environment. Manuel feels "privileged to work with an amazing group of dedicated and educated staff members, known as the Exceptional Team, who take pride in what they do to enhance the quality of life of our parents and clients by providing assistance, information, training, and support." As Director of Exceptional Family Center, Manuel's goal is to provide adequate resources and efforts to help families overcome the barriers that prevent many of them from having access to key resources and information. Manuel believes that with mutual collaboration and support, we can achieve this goal. Manuel has a B.S. in Business Management from California State University, Bakersfield and an M.B.A. from California State University, Monterey Bay. Kristhelen Hernandez is the SSI Specialist at Exceptional Family Center. She graduated from Santa Barbara Business College with an A.S Degree in Business Administration. Kristhelen began volunteering at EFC back in June 2010 while working for the Office of Clients' Rights Advocacy (OCRA), which advocates for Kern Regional Center clients. While volunteering at EFC, she demonstrated superior skills and knowledge and in 2011 she was offered an official position with EFC. Since then, Kristhelen has been providing families with the assistance needed to obtain SSI disability benefits. Kristhelen has an innate ability to help those in need, her kind attitude and professional demeanor and knowledge make Kristhelen the perfect person for this position. She is constantly learning about upcoming changes in SSI, rules and regulations and provides families with the knowledge they need to navigate the often times, complex SSA environment. Kristhelen is a great asses to Exceptional Family Center. Additionally, she works alongside EFC staff as the administrator of The Social Club which promotes development and friendship by having various monthly events for individuals with a developmental disability and their families in an engaging, respectful and fun environment, striving to promote equality, inclusion and long-lasting friendships. Juanita started as a volunteer with Exceptional Family Center in August 2016 and has been supporting EFC in its efforts of educating and providing access to resources and programs to the community. Juanita has been exposed to volunteer and community work since her parents often took her to do volunteer work at different places. Juanita has gets a sense of accomplishment from donating her free time to non-profit organizations and doing volunteer work and is thankful to have learned so much from the various organizations. She first found out about Exceptional Family Center from her parents, as they were part of a group of parents that took Computer classes from EFC and the admiration for her parents and the work EFC does for the community, encouraged Juanita to volunteer her time with Exceptional Family Center, to make a difference in the lives of so many in the community. Juanita's volunteer responsibilities with EFC range from answering phone calls, making appointments for SSI benefits, organizing educational and social events for families and clients, attending various community events to expose the services provided by EFC and much more. Juanita says that EFC is much more than a non-profit organization, it is more like a big family that welcomes everyone with a big smile and makes everyone feel welcomed and she is proud to be part of this family. Maria Cruz has been involved with Exceptional Family Center since the beginning, firs as a Parent-Volunteer (formerly known as Celebracion de Familias Excepcionales) and then as an employee. Maria first sought services at Exceptional Family Center when she received the news that her son had been diagnosed with Autism. She came across a Parent-support group and soon became a great project, an annual Spanish-speaking conference for parents and their children, a conference where parents would be equipped with the tools and resources to help their children succeed. since then, Maria has been involved with the planning of the Celebracion de Familias Excepcionales Conference, which will be celebrating its 11th Annual Conference. Exceptional Family Center gave Maria its first job in the United States, she has been involved with various causes and agencies in the community such as Promotoras de Salud, she has a great passion of helping others, sharing her knowledge and experience with other parents, giving them the support they need, another perspective of their concerns and she feels blessed to be part of this great organization. As a Special Projects Coordinator, Maria is responsible for keeping parents informed of the various events hosted by Exceptional Family Center, asking for feedback and engaging parents in all EFC-related events.